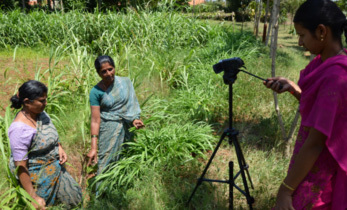 For Indian farmers reeling under deficit rainfall in Anantapur, Andhra Pradesh, rainwater harvesting and groundwater recharging structures bring all the relief they can get. The dryland district registered 212.6 mm rainfall this year, a huge deficit of 38.6%. Despite the deficit, smallholder farmers, using integrated water resource management techniques, are reversing the decline in the groundwater table. The rainwater harvesting and groundwater recharging structures constructed by a local NGO – Samatha Society for Rural Education and Development, with support from the Rural Electrification Corporation Limited (RECL) and ICRISAT, have created a net storage capacity of 35,600 m3 resulting in total conservation of about 70,000 m3 of surface runoff water in 2-3 fillings. “The rainwater harvested is helping us during the extended dry spell. 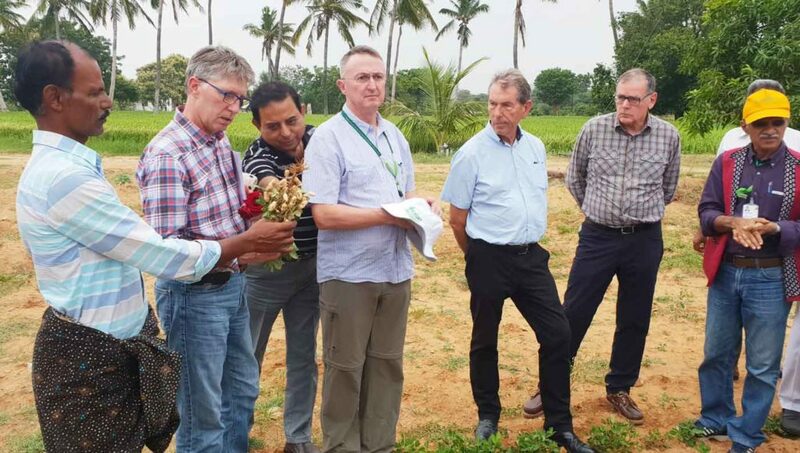 Groundwater levels are increasing as well, providing us enough for irrigation and cattle rearing,” farmers of Kondampally village told Dr Marco Ferroni, Chair, System Management Board, CGIAR. Dr Ferroni on his recent visit to India, toured the farmer-centric integrated watershed in Anantapur. 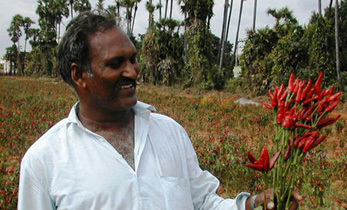 The project is being implemented through a convergence between ICRISAT and Governments of Andhra Pradesh and Telangana, their line departments, Krishi Vigyan Kendras (KVKs), Samatha Society for Rural Education and Development, BAIF-BIRDS (K) Hyderabad and community-based organizations. 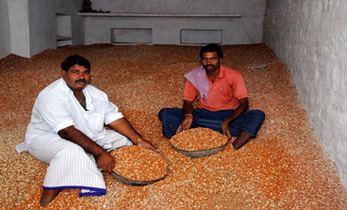 The Penukonda watershed (Anantapur district) is home to 1,480 families with groundnut, maize, paddy, finger millet, and sunflower as major crops. 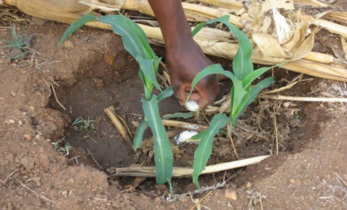 The watershed is the outcome of a consortium approach to undertake science-led interventions in soil and water conservation, soil health mapping and use of micronutrients. Various income-generating activities such as sheep rearing, improving the local goat breeds through crossbreeding with Sirohi goats, vermicomposting, nursery and home gardening were also taken up under the project. 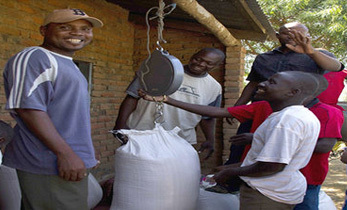 This science-led holistic approach also paved the way to organize several capacity building programs on community formation, participatory soil sampling, action plan preparation, use and application of improved crop productivity initiatives, and integrated pest management. “Building capacity of the farmers through knowledge-sharing and dissemination is vital to enhancing rural livelihoods,” said Dr Ferroni, after his interactions with women and men farmers. 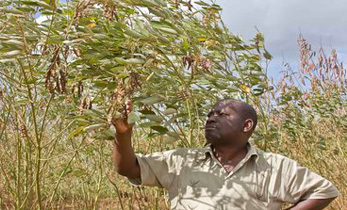 Improved cultivars such as ICGV 91114/350/351 in groundnut and ICPH 2740 and ICPL 87119 in pigeonpea coupled with in-situ moisture conservation practices in the region have resulted in productivity improvement by 25% in groundnut, and 27% in pigeonpea. Dr Ferroni, accompanied by Dr Nigel Kerby, Outgoing Chair, Governing Board, ICRISAT, Dr Peter Carberry, Director General (Acting), ICRISAT, and Dr Kiran Sharma, the acting Deputy Director General – (Research) of ICRISAT interacted at length with women and men farmers from Kondampally and Settipally villages. The team gathered feedback from farmers on the water conservation structures including check dams and farm ponds, and Dr Sreenath Dixit, Theme Leader, ICRISAT Development Center (IDC) led the demos on productivity enhancement, balanced fertilizers, high-yielding varieties, and decentralized on-farm seed production.